Delhi is the Indian capital city and union territory, It is bordered by Haryana on three sides and by Uttar Pradesh to the east. The British decided to change the capital of India in the year 1911 to Delhi from Calcutta, and New Delhi was built in 1912 south of the old city. Hindi is most widely spoken language. 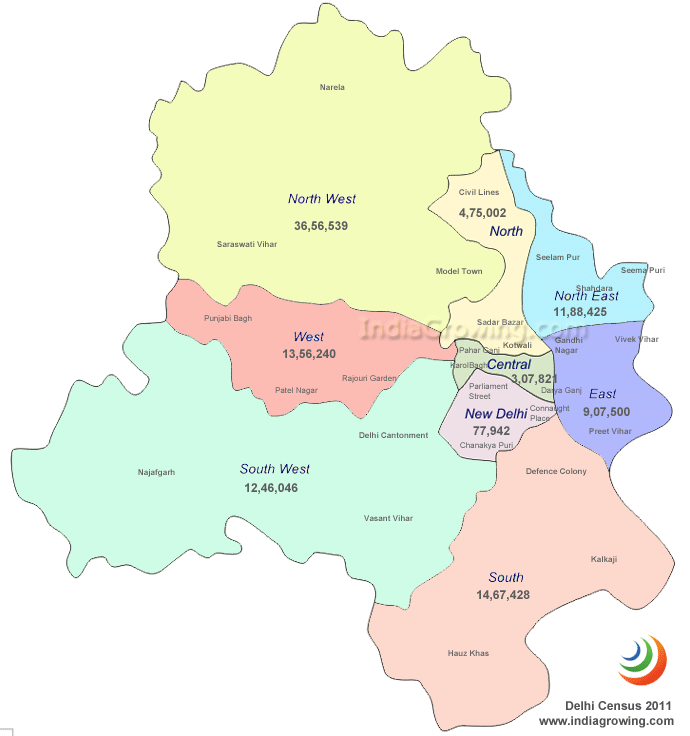 Delhi Population recorded as 16.7 million in 2011 census next populated city to Mumbai. As per the Aadhar Statistics the Delhi population in 2019 is 18,345,784 (18.35 Millions) as compared to last census 2011 is 16,787,941. Growth rate of 9.28 percent of population increased from year 2011 in Delhi. till 2018. The Delhi Election Results will be declared on December 8th. School admissions - Education helpline : 011-27352525, Register problems or complaints or donations about nursery admissions in delhi. The Delhi average altitude (elevation) 214 meters above sealevel.